Is the balance of power slowly shifting in Seville? Nuances and small details that paint a bigger picture can be lost amidst the intensity and emotion of derby day. For every full-blooded challenge, contested refereeing call and off-field incident, the result is ultimately all that determines which set of supporters hold local bragging rights until the teams next meet to do it all again. Spanish football’s feistiest derby match is no different but it took a fair bit of scratching beneath the surface to make any sense of two particularly exhilarating Sevillan dust-ups last season. The latter, a 2-2 draw in May at the Benito Villamarín in front of 55,000 screaming Real Betis fans, was the rarest of occasions where both sets of supporters could return home from a derby game with their heads held high having claimed a moral victory of sorts. The point ensured Sevilla clinched European football, a minor achievement by the extraordinary standards of their recent past but no mean feat given the difficult situation caretaker boss Joaquín Caparrós inherited when he had taken over from Vincenzo Montella just a fortnight earlier. The result also guaranteed Betis would finish the season above their city rivals for the first time in five years having had the better of the season’s two thrilling derby contests courtesy of a wonderful 5-3 win at the Ramón Sánchez Pizjuán in January. That victory in the relative cool of the Andalusian winter ended a 10-game winless streak for Betis in Seville derbies in domestic competitions, but even in the green and white half of the city, it was greeted more by a sense of surprise than any genuine belief that the seeds were being sown for a major power shift. 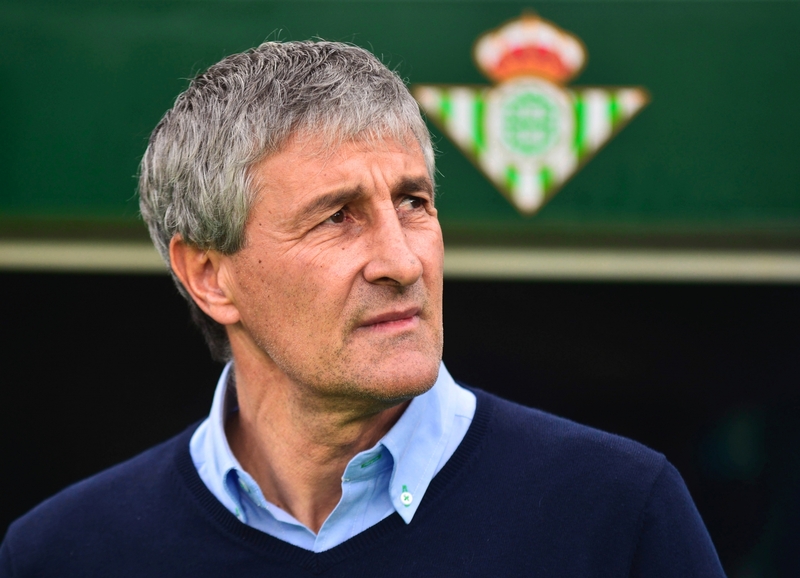 It came at a time when Betis had won just one of their previous nine matches with the pressure building on boss Quique Setién, who while being credited with bringing some long overdue entertainment to the Benito Villamarín, didn’t seem capable of stemming the flow of goals conceded. He’d only recently witnessed his side humbled by a 5-3 home defeat of their own in an all-Andalusian clash against second-tier Cádiz in the Copa del Rey. While the Seville derby win didn’t exactly guarantee him a long-term future at the club, it at least bought him more time with a board that wields the axe more frequently than most. Fast-forward four months to May and everything seemed to have changed with the Setién way now delivering both style and substance. The former Las Palmas boss had not only managed to see out a whole campaign – the first Betis coach to do so since Pepe Mel five years previously – but had inspired a late-season surge up the table to clinch Europa League football with three games to spare. Even more miraculously, Betis managed to put together a run of six straight clean sheets with the signing of Marc Bartra instrumental in suring up a defence that had conceded five or more goals on four separate occasions between October and January. Meanwhile, a couple of miles north-east from the Benito Villamarín in the more upscale district of Nervión, it was Sevilla that were dealing with a Betis-like crisis. The January derby defeat, their first at home in any competition in over a year, was followed by three more home losses in as many months with visiting teams warming up to the idea that fortress Pizjuán was no longer quite so impenetrable. Despite a famous Champions League win in Manchester and a run to the Copa del Rey final, Sevilla’s league form deteriorated to such an extent that they had little choice but to dispense with their second coach of the season as Vincenzo Montella was sacked with just four games to go. Joaquín Caparrós, the man credited with laying the foundations for a remarkable era of success, returned to guide Sevilla to two important home wins that ultimately eased the pressure heading into the return clash with Betis. However, the second Seville derby of the season served to highlight just how the dynamic had changed and how the balance of power in the Andalusian capital was possibly starting to shift. It was more than the mere fact that Loren Morón’s leveller for Betis ensured their supremacy in the final standings but the whole atmosphere and build-up to the game that just felt different to almost any other meeting over the previous decade or so. The day had started with Sevilla’s team bus rocking up at the stadium of their great rivals with one of its windows smashed and their famous club anthem blaring out. Sitting immediately adjacent to the broken window was an animated Caparrós, belting out the Himno del Sevilla with his fists pumping in deliberately dramatic fashion. He was later forced to apologise for offensive gestures made to Betis fans, but the fact that all this was filmed from inside the Sevilla team bus is only testament to their efforts to make a statement. Caparrós is a symbol of Sevilla and only grew his reputation as a father-like figure by successfully guiding the team into Europe, so his actions that day can’t be brushed off as a moment of madness by an admittedly egocentric coach. Having dominated the fixture and the rivalry for so many years, in which they’d often had bigger fish to fry, Sevilla had suddenly been reduced to acting like the noisy neighbours; for once the underdogs on derby day, trying to make themselves heard against a rival that appears to have found its soul again. In the short-term, Caparrós’ plan may have worked. Sevilla restored some pride with an improved display but for the first time in over a decade, their camp exuded an acceptance that the debate over football supremacy in their city was open again and that they had a rival that was more than just the ugly, poor relation, who could invariably be swept aside. That, more than the results and league table, will give Betis confidence going forward to truly step up their battle for dominance in what is in many ways Spain’s most fascinating football city and something of an anomaly in the national sporting spectrum. Even faced with the challenge of a new European powerhouse in the shape of Atlético Madrid, Barcelona and Real Madrid remain too wrapped up in one another to pay much attention to what’s going on across their own towns. Valencia also has a clear natural hierarchy while other derbies in Spain are predominantly regional affairs, but we now appear to be heading into a truly competitive era for the only Spanish city rivalry that is guaranteed to always set pulses racing. As Betis fans know only too well, though, there have been false dawns before and plenty of them. The last time followers of Los Verdiblancos had reason to get genuinely excited was the 2004/05 campaign. A fourth-place finish with a team comprising of talented Brazilians Denílson, Ricardo Oliveira, Marcos Assunção and Edu brought Champions League football to the Benito Villamarín for the first time. They also won the Copa del Rey that season, ending a 28-year trophy drought in the city of Seville. With the mercurial young talent of Joaquín to rely on, Betis looked well equipped to step up and compete with the top sides in Spain and further afield. Victory over 2004 finalists Monaco appeared to confirm that as they advanced into the Champions League group phase, but just when it appeared that they were the Sevillan club on the cusp of a possible period of sustained domestic and European success, the great Betico dream turned sour. Paired with Liverpool and Chelsea, they failed to make the Champions League knockout stages and could only manage a disappointing 14th place finish in LaLiga, which in part convinced Joaquín to leave and join Valencia. If the departure of the club’s most exciting youth product in a generation was tough for Betis fans to take, the UEFA Cup final triumph of their rivals that same summer only compounded matters. 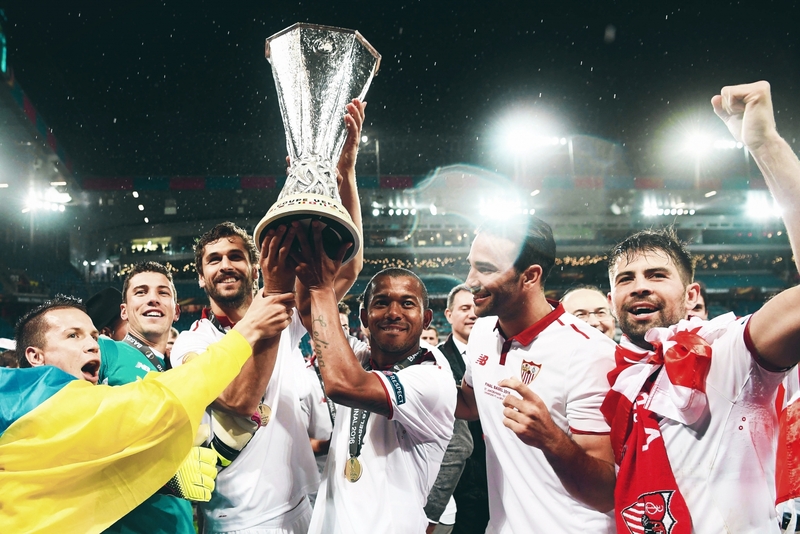 Before long, Sevilla had fully cemented their status as top dogs in the city, embarking on an unprecedented era of success at home and abroad. Betis had no answer. A depressing demise for the class of 2005 and a couple of seasons in the second tier followed and they had to wait for the reign Pepe Mel, who guided the team back to the top flight, for anything really to shout about. 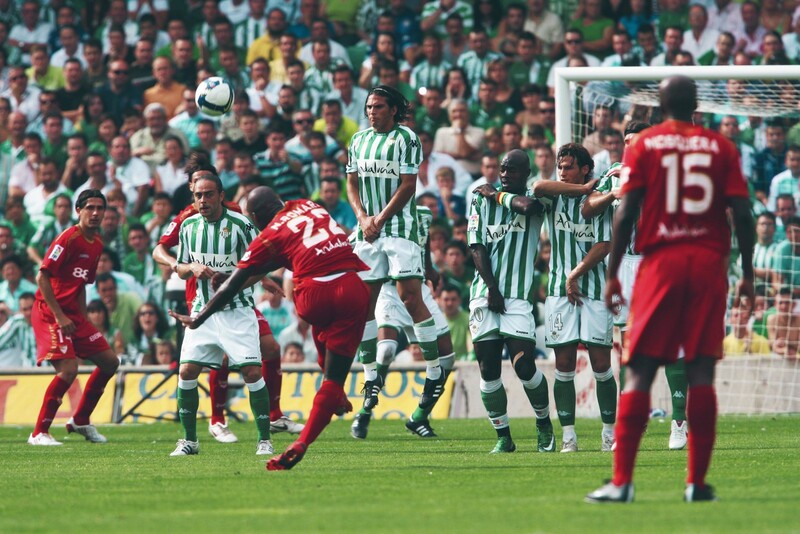 A seventh-place finish in the 2012/13 season saw Betis finish above their city rivals for the first time in eight years, but by this point, Sevilla was a very different beast. Their UEFA Cup victory was the first of an extraordinary haul of six major trophies in four years – not bad for a club that had previously gone half a century without collecting any silverware other than a couple of Segunda División crowns. Any hopes that Mel could somehow propel Betis to a level where they could consistently compete with their neighbours were brought to a shuddering halt the following year. A desperate domestic campaign saw Mel sacked as Betis finish bottom of LaLiga and lost both league derbies by an aggregate score of 6-0. Their one hope of salvaging any sort of pride came in the unlikely source of the Europa League when the Sevillan clubs were paired together in the last 16 stage. A shock 2-0 first leg away win for Betis at the Ramón Sánchez Pizjuán was celebrated wildly in the green and white half of the city but once more, the jubilation would soon subside to feelings of anger and perhaps despair. Betis contrived to throw away their two-goal advantage at home as Sevilla dramatically advanced on penalties at the Benito Villamarin. To make things worse for fans of Segunda-bound Betis, Sevilla went on to win the trophy that year before repeating the feat in each of the next two seasons to hammer home their dominance of football matters. Their ability to win nine trophies in the space of a decade has forever changed the goalposts for both teams in Seville. While people on either side of the divide will point to differing social and political stances, like many great rivals, Sevilla and Real Betis previously had far more in common than they might have cared to admit, with the 20th century seeing neither club win the silverware to live up to their respective ‘big club’ tags. Sevilla may have raised the bar to new heights that will be hard for either to match again but Betis fans finally have a few compelling reasons to believe that this dawn may be different and that this is their time to shine bright and displace their city rivals as the pride of Seville. There is a case to be made that this is the start of a relative decline for Sevilla – or at least a cessation of their ability to perform miracles. The man largely heralded as the brains behind their period of sustained success was sporting director Monchi, who left for Roma last April. Sevilla made around a €200m transfer profit during his time at the club, with Monchi boasting an incredible knack for picking the right player who would not only improve the team but in all likelihood eventually be sold on for a greater sum. As a result, the first season following his departure was always going to be a pivotal one for Sevilla in their efforts to move into a new era whilst attempting to adhere to Monchi’s legacy. On the surface, it wasn’t a total disaster. They broke new ground in the Champions League by making the last eight and replicated the 2015/16 season in finishing seventh in LaLiga and reaching the Copa del Rey final. In any other year, they could probably brush off the fact they came second in their own city as the result of cup distractions and Betis enjoying a freakishly good campaign. However, the symbolic significance of the first post-Monchi season makes that far more difficult to do. In any case, Sevilla’s finishing position and cup runs flattered them somewhat and the fact that two coaches were sacked in the space of four months speaks for itself. On the pitch, Sevilla never quite hit top gear, relying mostly on a host of scrappy home wins to spare them the altogether more mediocre season that some of their football warranted. With a sprinkle of Monchi magic missing, Sevilla’s transfer business was also decidedly more ordinary with more misses than hits. Major summer acquisitions included the likes of Luis Muriel, Nolito, Guido Pizarro, Sébastien Corchia and Simon Kjær. Despite an outlay of over €50m, not one of those players would start over half of Sevilla’s league matches. There was certainly a hint of irony in that Sevilla’s most successful signing was the recapture of Éver Banega, a player originally signed by Monchi. If an ability to sell their top players and wisely reinvest was instrumental in Sevilla’s rise to become a major force in Spanish and European football, so was their ability to make good coaching appointments. Juande Ramos and Unai Emery delivered two waves of silverware, while the likes of Manolo Jiménez and Jorge Sampaoli inspired impressive top-four finishes in LaLiga and ensured the relentless positive momentum carried over even when top players and coaches left for bigger pay packets. Last season, however, saw Sevilla make what has to be viewed as two poor appointments. Eduardo Berizzo appeared a good fit to take over from Sampaoli but never really got the best out of his newly-assembled squad. The decision to sack him in late December didn’t exactly improve matters and was hardly a positive PR move for the club given it came just a month after Berizzo’s cancer diagnosis, which had prompted fans to unite around their new coach. Impressive cup wins over Atlético Madrid and Manchester United failed to see Vincenzo Montella gain the same kind of warmth, with the Italian appearing an odd choice from day one. By contrast, Betis now appear to be the club getting the big calls right off the pitch. Quique Setién was their boldest, most exciting coaching appointment in many years, but many doubted whether he would be able to get a fairly uninventive Betis squad to adapt to his possession-based approach. While things took time to click into place, Betis ended the season having enjoyed more of the ball than every club in LaLiga besides Barcelona and Real Madrid, scoring more goals than second-place Atlético and 11 more than Sevilla. Their approach in the transfer market was also for once savvier than that of their neighbours. They received €16.5m from Real Madrid for the services of young midfielder Dani Ceballos last summer, which helped fund the signings of the likes of Andrés Guardado, Sergio León and Cristian Tello for considerably smaller fees as a much-needed overhaul took place to give Setién a squad more suited to his methods. While there was an element of risk to Betis’ new approach, 12 months on the results speak for themselves. All of a sudden, Los Verdiblancos feel like the more stable Seville club with a clearer identity and vision for how they want to operate on and off the pitch. After an aimless few years, they now appear to have a clear direction, and it’s one their fans have bought into. That has helped ensure that even the board’s decision to expand what was already one of the largest stadiums in LaLiga has paid off, with followers of Betis flocking to the Benito Villamarin in huge numbers. Their average home league gate was over 45,000 last term, the fourth-highest figure in the Spanish top flight and 13,000 more than what their city rivals could attract. A 60,000 capacity figure could swell further were Betis to finally fulfil their potential and become genuine challengers at the top end of LaLiga or enjoy the kind of European runs that Sevilla have become accustomed to in recent years. That may be the medium to long-term goal but if history is anything to go by, Betis can’t afford to get too far ahead of themselves and risk the foundations that were laid last season going to waste. While Sevilla may still have the cash windfall from recent European exploits, Betis’ ability to put bums on seats will only aid them as they attempt to compete financially. 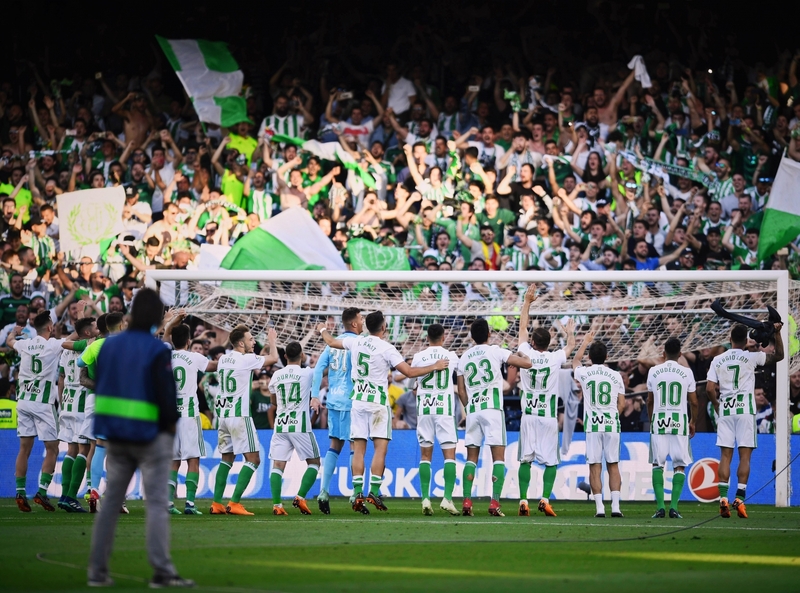 Europa League football in 2018/19 will help Betis grow their coffers and attract a better quality of player but it is worth noting that in recent years the extra demands of continental action have proved too much for the likes of Celta Vigo and Real Sociedad following similar breakthroughs in LaLiga. There are cautionary lessons to be learned on just about every corner but there is also a real sense of hope, perhaps even belie, that Betis could be on the cusp of something special this time. Holding onto Setién will be vital. Reduced to tears when Betis clinched European football last term, he is the most important piece in the jigsaw and his insistence that he had no interest in taking over as the Spanish national team boss this summer has only strengthened the emotional bond that has been built up between him and the supporters. The Betis hierarchy has had a tendency to make rash decisions in the past and has rarely stuck to one clear philosophy, but even they must know a good thing when they see one. Their transfer activity this summer has again seen them cash in on a product of a youth academy that is churning out the talent once more. The €30m sale of 22-year-old Fabián Ruiz can be looked upon from different angles. On one hand its systemic of a club that has still not quite reached a level where it can hang onto to its bright young things. However, it can also be viewed as the actions of a board making smart business decisions at last, particularly when you consider that sale more than covers the money invested this year in Marc Bartra and William Carvalho, two players with considerable Champions League experience who are just heading into their prime years. Suddenly the two Seville clubs are operating on more of a level playing field, with European football in Heliópolis helping Betis compete for a higher calibre of player. Meanwhile across town, Los Rojiblancos have another new coach in the shape of former Girona boss Pablo Machín and have considerably more to figure out ahead of a season that starts inconveniently early in Europa League qualifying. They do at least have a €36m cash windfall to play with following the sale to Barcelona of Clement Lenglet, another inspired Monchi signing. However, it seems no longer a given that they will reinvest that cash wisely, and while Machin did brilliantly in Catalonia, he has never won silverware as a coach and has a big job on his hands at the Ramón Sánchez Pizjuán. 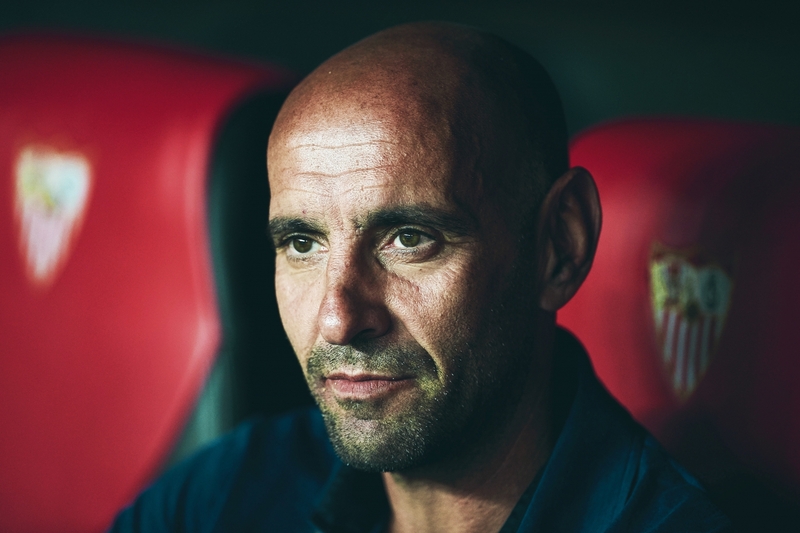 Sevilla need to respond with a big season, not just to reassert authority in their neck of the woods but to prove their golden age isn’t over and that they can continue to challenge at home and abroad without Monchi overseeing everything. In Setién’s Betis, though, they finally have a worthy city rival and the scene is set for a titanic power struggle over the months and years to come in the Andalusian capital.